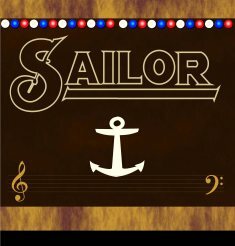 Here you can find out some more details about SAILOR's various Nickelodeons and see some pictures of the instruments - from Georg's original creation to the Steinway-Nickelodeon and all the other successors. The band new 'Mark 7' Nickelodeon was first used in August 2010. 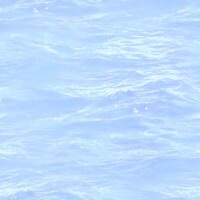 You can see it at the bottom of this page. 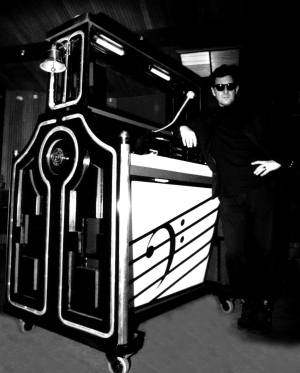 Within a very short time, in fact possibly as little as a month after the final mix of the SAILOR album, Georg had come up with the solution: a custom-designed all-purpose machine, the constituents of which were two upright pianos, two synthesizers, mini organs and glockenspiels all mechanically linked and contained within a wooden frame also designed by Georg. Construction work took place above a pub, appropriately in one of the seedier parts of London. Henry: "I remember standing next to Georg handing him hammers, nails, glue, sandwiches and anything else required, as he set about his creation like a man possessed! After the final staining of the wood which made it resemble some strange piece of antique furniture, I recall standing back, looking at it and thinking: 'He actually expects us to play the bloody thing?'" 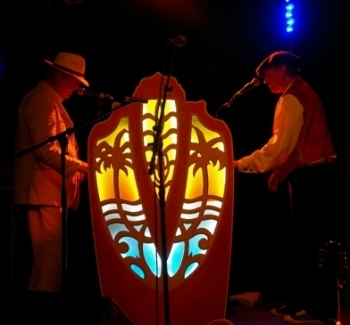 The basic keyboards were back to back, enabling Phil and Henry to face each other when playing, and also to talk to each other when bored. Phil played what was referred to as the bass side, Henry the treble side, and so the Nickelodeon was born. 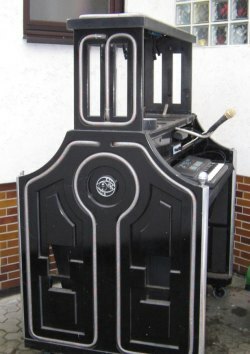 "Finally a few words about the £ 7000 dream-machine which bears a passing resemblance to duplicate honky-tonk pianos removed from any Dodge City saloon during Gold Rush era and placed back to back on stage. 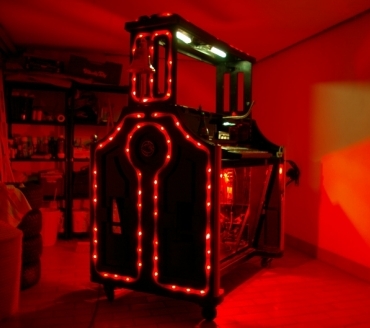 The instrument is basically Georg's brain-child and is in fact the casing of two upright pianos moulded together to look like an old-fashioned barrel-organ and raised on a rostrum so that it can be played standing up. 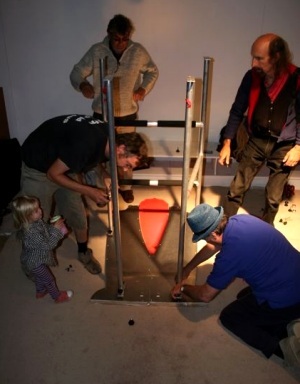 Georg rigged up some piano keys to a Piano Mate, two synthesisers and a glockenspiel device was adapted from a series of doorbell mechanism which instead of activating a clapper to hit a bell now sets of little hammers against glockenspiel bars. There is a DC current activated by that part of the piano action which is like hammer, so you can play glockenspiel and piano together or either separately. Other synthesisers fitted underneath provide bass pattern from a keyboard and there are one or two secret modifications which they are keeping secret. The device which is quite unique and their own patent is now insured for an undisclosed sum and almost priceless." After SAILOR´s reunion in the 90s a new Nickelodeon had to be created. 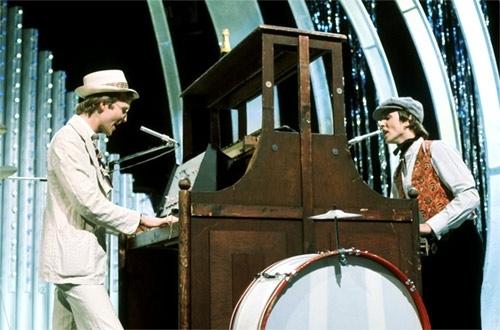 The new blue Nickelodeon was at first only needed for TV performances, so that the keyboards on Phil´s and Henry´s side were placed on it in order to perform with playback. 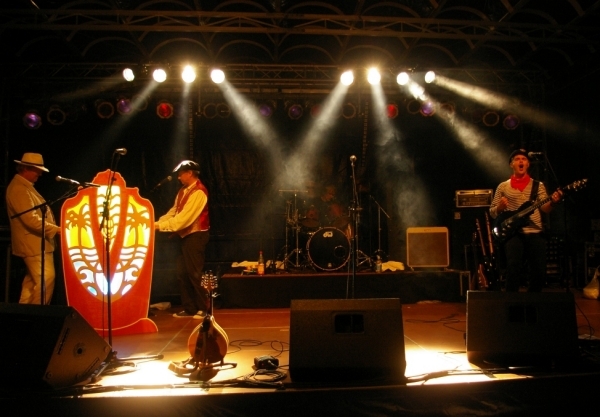 When SAILOR were finally able to perform live again it was necessary to create a new Nickelodeon for live concerts. The construction of the black Nickelodeon happened in 1993. 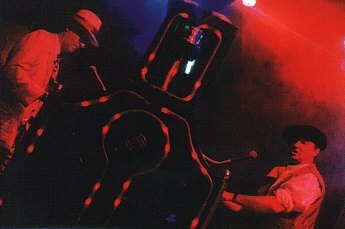 The black "GK" Nickelodeon had a red lightchain and a bell. It was so big and heavy that it needed its own van and driver to get to the concerts. Georg about the black Nickelodeon: "... The next one was the black one - the sort of Steinway-version of the Nickelodeon - which cost a huge amount of money. I think it was very beautiful, and of course it collapsed, but it still weighed a ton, and it was a monster - a serious piece of kit, as they would say. 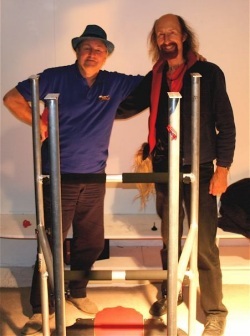 It was a very substantial piece of equipment, but hey - it was a substantial part of SAILOR! That's something I completely designed and had built, I didn't build it myself, but I had people build it. But I designed all the details on it, which took a lot of time. I thought it looked very nice, I was very pleased with that one." In 1996 another Nickelodeon had to be built because the black Nickelodeon's keyboard on Henry's side had been "injured" during a performance in late 1995, and there were also other difficulties, e.g. because the red lightchain was broken. That´s why SAILOR decided to build a new Nickelodeon. The result was a Nickelodeon which was made out of plastic. 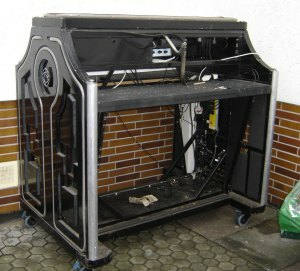 It contained many small plastic parts and a metal frame, so that it could quickly be built before SAILOR´s performances without taking up too much space during the transport. Inside the metal frame there was also room for a fog machine and some special lights. 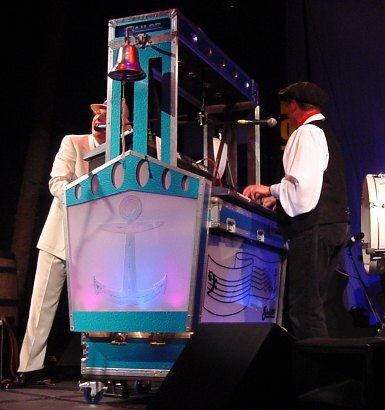 During the last years there were two Nickelodeons that were being used by SAILOR for their shows - the black plastic-version created in 1996 (see above) and the blue version created in 2001 (see above). 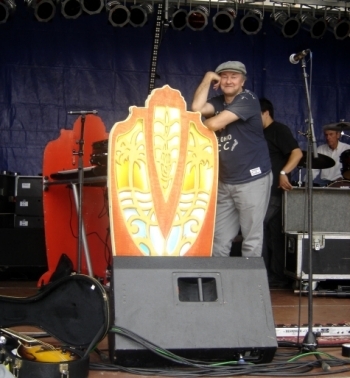 In 2004 Rob Alderton designes another version, as Phil Pickett explained in his Holland Tour Diary: "Rob has been designing a wonderful new "frock" for the keyboards on certain shows where the "Nick" might be too cumbersome, or expensive for certain promoters. 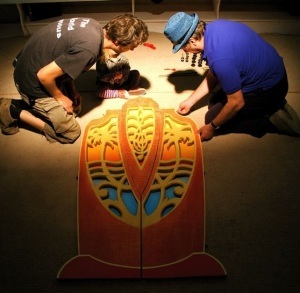 It's beautifully elaborate and intricate in design and we're sure, if asked nicely he might eventually post it on Marinero some time in the future." For a long time now fans of SAILOR will be aware that however much they have enjoyed and appreciated the band over the years, ocean-going amounts of imagination were required to recall past glories in relation to its theatrical, highly distinctive and totemic mascot - the infamous "Nickelodeon" - long considered to be SAILORs audio-visual trademark by fans and promoters the world over. Of course, for those in the know all of the subsequent versions were loosely based on our very first solid wood contraption replete with doorbell mechanisms, Kemble back-to-back pianos and the earliest of stone-age synthesizers, all lovingly assembled by our own youthful hands back in the day at the Nightingale pub in wood Green - possibly the heaviest and most complicated musical instrument ever to grace a stage! Hundreds of shows and tours had sadly rendered the latest edition, last in a long line of imitations virtually unusable, (Mark 6 according to Katrin Wagner including the dreaded cabaret Table-odeon but lets not go into that please!) - battered and "unfit for purpose" with all that was left  just a few bits of cardboard and sad twisted metal. So the road to our beautiful brand new shiny 'Nick' in some strange metaphysical way (in my mind at least) started way back last autumn 09 when upon leaving Prezzos with Ann late one night in my home town of Lewes, I glimpsed the back of a custom-built intriguingly-designed van shooting past, the only thing I could make out on the back of which was "X-Piano Orchestra" and "A hundred smiles per hour!" But alas, no phone number. 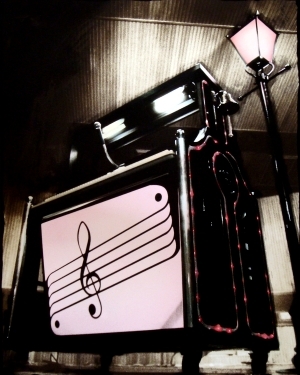 Later scouring the net I found a Myspace site for the "X-Piano Orchestra" and someone called Paul Harrison. I left several messages over the passing weeks but alas, received no reply whatsoever. Having all but given up hope in this direction, a few months later I happened to visit a lighting store in Brighton to look into some new ideas for the group and its theatrical development, whereupon a conversation with the owner unexpectedly led to a reclusive local boffin named Paul, a builder of amazing props for all kinds of theatrical events - even Disneys "Lion King" up in the West End, Brighton storefronts and props for MTV videos. "Is he by any chance connected with the X-Piano Orchestra?" I enquired, only to delightfully realize that this was indeed the individual concerned. Unfortunately the owner had no contact details for Paul but a vague idea that his workshop was somewhere under the arches of the huge viaduct that trains slowly traverse on their last leg towards Brighton station, but couldnt tell me exactly where. After several sorties in my car, much walking around asking puzzled passers-by and knocking on doors, out of the blue I eventually came upon the old van parked adjacent to some workshop buildings... Eureka! Henry will back me up on this, (as admit in my enthusiasms am prone to occasional exaggeration!) but knocking the door, finding it slightly open and hesitantly entering Pauls topsy-turvy workshop, I suddenly felt like a child again walking into a vast emporia of Disney magic, a dark twinkling cave of stage props, masks, musical instruments and charming mannequins the like of which Id never seen outside of Toy Story or Pinnochio (for older readers!) 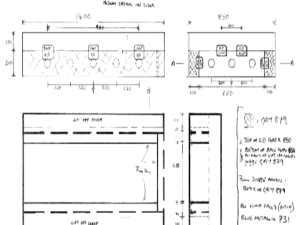 At three in the afternoon the boffin-designer-in-chief himself, a modern-day Gepetto, was actually fast asleep on a raised platform bed above his desk. You couldnt make it up! After a few cups of tea, initially drowsy and no doubt startled by a stranger entering his workshop (also apparently his home!) 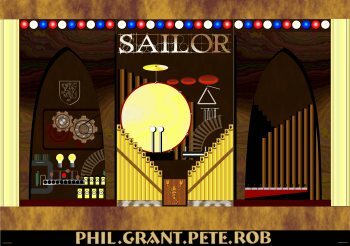 unannounced, Paul immediately warmed to the theatricality of Sailor, remembered all of our hits and was thrilled to be asked to design and build SAILORs Nickelodeon Mark 7. I knew I had definitely come to the right place! 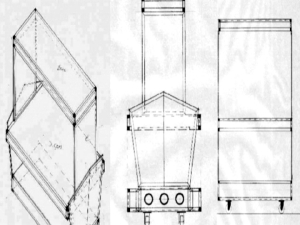 Over many visits and consultations in the weeks and subsequent months, Paul, with technical assistance and exquisite design of the internal structure and engineering aspects from staging expert, Alex Saunders, began to construct a model. Armed only with stringent weight, size and design requirements from Henry and myself plus a few old photographs from fans, they thoughtfully, and with a wonderful eye for quality, elegance and detail slowly designed and assembled the unique new construction you now see before you and that we are proud to call "The Nickelodeon Mark 7". The inaugural "build and pack" on August 6th, only one day before our show in Torgau, Germany was incongruously attended by none other than the self-proclaimed "God of Hellfire" himself also no stranger to camp theatricality and entertainment...the legendary Arthur Brown. Dont ask me why! Like moths to a flame, the universal laws of Theatrical Entertainment are obviously governed by mysterious dark forces of which we know not! With help from Alex's daughter Ray...and Arthur!